Roses (Rosa spp.) produce showy, fragrant blooms that make them popular not only with gardeners, but also with various insect pests that enjoy feeding on the foliage. One common pest is the rose slug, which will feed on any rose species, including the Carolina rose (Rosa carolina) and the Knock Out rose (Rosa Radrazz), both of which grow in U.S. Department of Agriculture plant hardiness zones 4 through 9. You can choose from various control methods to kill rose slugs and keep your rose plants looking fabulous and smelling great. Despite their name, rose slugs aren't actually slugs. Instead, they are the larvae of rose sawflies, non-stinging, flying insects that belong to the wasp family (Tenthredinidae). Three species commonly appear on rose plants: the rose slug (Endelomyia aethiops), the curled rose slug sawfly (Allantus cinctus) and the bristly rose slug (Cladius difformis). Adult sawflies have yellowish-green bodies that reach 1/4 to 3/4 inch in length, while the larvae have 1/2- to 3/4-inch long, yellow-green bodies, yellow to yellowish-orange heads and several caterpillar-like legs. Although the three species look similar when it comes to size and coloring, bristly rose slugs have wiry hairs covering their bodies, while curled rose slug sawflies curl up when resting. All three rose slug species inflict similar damage and require the same treatment methods. Young rose slugs feed on soft leaf tissue, leaving just veins and a papery, see-through surface material behind. Mature rose slugs frequently chew big holes in the foliage. Although mild infestations might make plants look unattractive, the roses suffer no lasting damage. Severe infestations not only make leaves curl and turn brown, but can also cause severe defoliation, which leaves plants weak and vulnerable to diseases and other insect pests. If you detect rose slug problems early on, you can often get rid of the pests using simple nonchemical control measures. Start inspecting your rose plants about mid-spring and continue throughout the entire growing season. Search the tops and undersides of leaves for the small slugs, picking off the pests you find and dropping them into a pail of soapy water. Pruning off infested foliage and discarding it in a covered garbage can destroys sawfly larvae, as does spraying your plant with a strong jet of water from a garden hose. Consider treating a severe rose slug infestation with an insecticidal soap solution. This less-toxic option desiccates and kills the pests without harming people, pets or most beneficial insects, with the exception of predatory mites. As always, carefully read and follow the instructions on the manufacturer's label. A typical mix is 4 teaspoons of insecticidal soap concentrate with every 1 quart of water. Use a handheld trigger sprayer or small garden sprayer to completely cover all foliage, including the tops and undersides of leaves, as well as the soil beneath the infested rose plant. Insecticidal soaps have no residual action, so the solution must make direct contact with rose slugs in order to be effective. Repeat treatment every seven to 14 days until you spot no more rose sawfly larvae on your plants. Although nontoxic to humans, insecticidal soap can still cause eye and skin irritation on contact. Reduce the risk of exposure by wearing goggles, long sleeves, pants, waterproof gloves, a face mask and shoes with socks whenever mixing or spraying a soap solution. Avoid spraying insecticidal soap mixtures on fully sunny days or you risk burning the leaves. 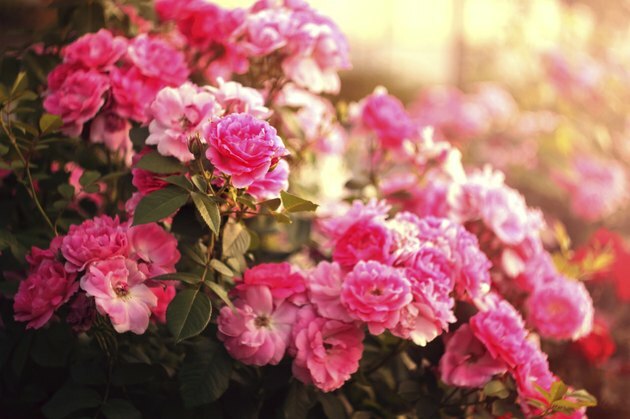 Spraying your roses in the early morning or around dusk helps prevent foliage injury while allowing you to avoid harming honeybees and other pollinating insects.